Some details about what's in the report have been made public, including the disclosure by the state Supreme Court that it will identify more than 300 "predator priests"
A damning report into allegations of decades of child sexual abuse at the hands of clergy members and efforts to cover it up in six of Pennsylvania's Roman Catholic dioceses is expected to be released in the coming days. The court said if the challengers didn't object to redactions made by the attorney general's office, the report would be released by last Wednesday. That date came and went without the report's release, suggesting there is a behind-the-scenes conflict pending before Cleland. The court directed Cleland to resolve any redaction disputes and then release the report by 2 p.m. on Tuesday. The justices also warned the lawyers against "provoking or instigating unnecessary ancillary litigation" over producing the redacted version of the report. 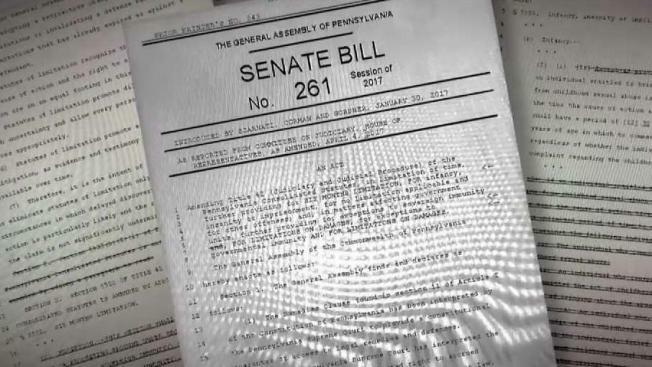 Some details about what's in the report have been made public, including the disclosure by the state Supreme Court that it will identify more than 300 "predator priests." In June, Cambria County Judge Norman Krumenacker, who supervised the grand jury, said the findings involved allegations of child sexual abuse, failure to report it, endangering the welfare of children and obstruction of justice by people "associated with the Roman Catholic Church, local public officials and community leaders." The bishop of Pittsburgh told parishioners the report was "a sad and tragic description of events that occurred within the church" and noted almost all reports of abuse in his diocese occurred before 1990. A retired Erie bishop withdrew his objection to the report's release after prosecutors agreed some of its broad claims were not directed at him. A court filing in that matter said the report concluded that victims were "brushed aside, in every part of the state, by church leaders who preferred to protect the abusers and their institutions above all." The report found that "diocesan administrators, including the bishops, often dissuaded victims from reporting abuse to police, pressured law enforcement to terminate or avoid an investigation, or conducted their own deficient, biased investigation without reporting crimes against children to the proper authorities." In seeking to force change to the report, lawyers for nearly two dozen unnamed current and retired clergy members filed a group response last month alleging it is replete with "improper assertions," ''gross mischaracterizations, oversimplifications and outright erroneous conclusions." In a July 27 order, Chief Justice Thomas Saylor said the grand jury worked to expose child sexual abuse "and concealment of such abuse on an extraordinarily large scale." Saylor said that ideally the people named in the report as having committed criminal or morally reprehensible conduct would have been given an adequate chance to appear before the grand jury and provide their responses. He said those who didn't get that chance are entitled "to this court's further consideration of whether additional process can and should now be provided as a curative measure." That will be the topic of a September argument session before the high court in Philadelphia. Amid the legal back and forth, Attorney General Josh Shapiro recently wrote to Pope Francis, asking him to pressure the state's Catholic leaders to withdraw any objections to releasing the report. A lawyer for some of the petitioners complained that prosecutors were reaching out to the pope to try to get their way. Two priests have been charged criminally as a result of the grand jury investigation, but the state's statute of limitations for child sexual abuse is a barrier that could prevent additional charges, particularly considering that many allegations go back decades. NBC10, Telemundo 62 and other news organizations and Pennsylvania Attorney General Josh Shapiro in asking the court to release the report.